To view a larger image click on the photo. 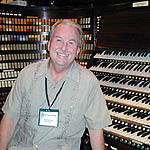 At the console of the famous Wanamaker Grand Court Organ, the largest completely playable organ in the world, at AGO Philadelphia, July 2002. Peter Richard Conte, the wizard who presides over this magic giant, is a phenomenal artist with a gift for "wowing the crowd" in any genre of literature. Take in one of the daily recitals at the store and enjoy a treat. At this convention, I attended every one he played and learned a great deal from listening to him. 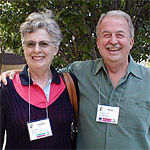 With my friend and colleague, Dr. Judith Hancock at ChicAGO '06 in July. Judith is a superlative musician, organist, choirmaster and teacher who, along with husband Gerre (both are represented by Karen McFarlane Artists) comprises the archetypal dynamic duo. 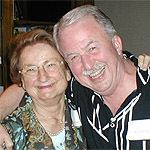 With Marie-Claire Alain at a party given in her honor by the Dallas Chapter of the American Guild of Organists, May 2006, an early recognition of her 80th birthday year. Madame was presented with gifts and an extensive memory book of tribute letters and photographs. Her recital the following evening was a rare combination of mature, sophisticated musicianship with a stunningly vibrant energy. MCA is a prime exemplar of the aphorism, "Age is but our chronology, youth our state of mind." 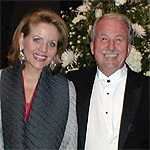 It was a privilege to play the organ part for super-star soprano Renée Fleming in the Mozart "Exsultate jubilate" with the Baton Rouge Symphony for its Pennington Great Performers in Concert Series on October 9, 2006. Renée is a consummate artist and a genuinely gracious person. Her stunning Baton Rouge debut was the highlight of the fall concert season in Louisiana. 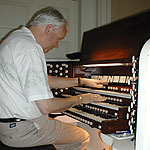 At the console of the Great Organ (138 ranks) at Saint Thomas Church Fifth Avenue, New York City, September 2004 during an all-Karg-Elert program. I have been privileged to play eight recitals at Saint Thomas Church over the years and always am awed and inspired by the instrument and the magnificent ambience of the building. 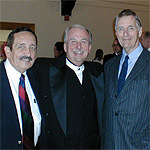 With composer Kenton Coe and concert patrons of the 25th Anniversary Celebration of the East Tennessee State University Friends of Music, October 2004, at St. John's Episcopal Church in Johnson City, Tennessee. We both are proud to have been original co-founders of the Friends of Music and the anniversary occasion was celebrated with a concert devoted entirely to Kenton's works. I performed with other colleagues and gave the world premiere of his Second Fantasy for Organ. 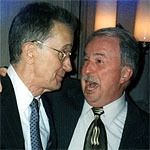 With my teacher, mentor and friend Gerre Hancock on the occasion of the Hancock Farewell Gala at Saint Thomas Church Fifth Avenue in New York City, May 2004. Gerre has a quick wit and an ebullient sense of humor, coupled with the ability to tell you a joke that contorts your face with laughter, while his countenance remains one of sly innocence. 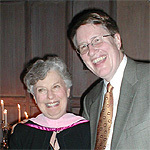 Friend and fellow Gerre Hancock student, Dr. Stephen Schaeffer, Organist/Choirmaster of the Cathedral Church of the Advent in Birmingham, shares a laugh over the finer points of organ shoe design with Dr. Judith Hancock after the Hancock Farewell Gala in New York City in May 2004. 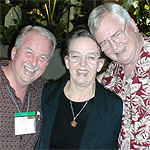 With treasured friends Ken and Ellen Hart at AGO Los Angeles, July 2004. 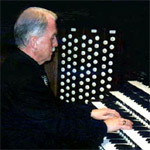 Ken is Director Emeritus of the Graduate Sacred Music Program in the Perkins School of Theology at Southern Methodist University and Dean of the Dallas Chapter, AGO. Ellen, a native of New Zealand, is a gifted organist, choirmaster, teacher and composer, as well as a Past Dean of the Dallas Chapter. 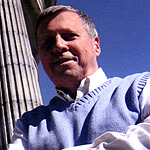 My cherished friend, Dr. Stephen Hamilton, in Perkins Chapel at Southern Methodist University in May, 2006. Ken Hart was showing us the changes and additions to the instrument, as well as the beautiful restoration of the building. Dear long-time friend concert pianist Kenneth Huber is a truly poetic musician. 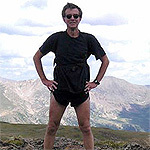 Ken infuses the "mountaintop experiences" from his hiking into his playing. include a full-length musical comedy. 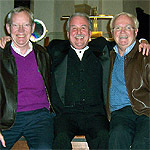 On the organ bench with fellow artists and special friends since undergraduate days at Ohio University, Steven Houser and Richard Yoho after my recital at Rollins College ­ Winter Park, Florida, January, 2006. 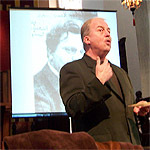 Presenting an illustrated lecture on Sigfrid Karg-Elert at the Romantic Organ Music Conference in Knowles Chapel at Rollins College - Winter Park, Florida, January, 2006. 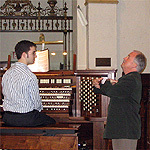 Teaching a Master Class as part of the Romantic Organ Music Conference at Rollins College in Winter Park, Florida, January 2006. Along with leading hymn singing, there is nothing I find so inspiring as working with students.